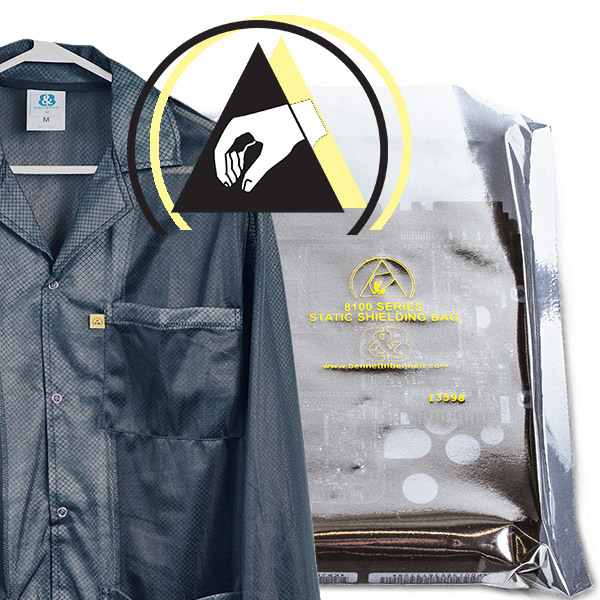 Per ANSI/ESD S8.1 the ESD Protective Symbol is printed on ESD smocks, static shielding bags, and ESD Sheet Protectors for binders. We do so following ANSI/ESD S8.1 which states it be used to mark any garments or packaging whose function is to protect electronics from ESD. In particular, it should be used to mark any product that serves a “static shielding” function. On our ESD Sheet Covers, we include the letter D underneath the ESD Protective Symbol per IEC 60417 6202 and EN 61340-5-3 indicating it is electrostatic dissipative. It is important for products like sheet covers that also dissipate static charges on their surface to indicate they are static dissipative- typically polymer-based materials like flexible packaging on which charge decay tests are performed. S is for electrostatic discharge shielding. F is for electrostatic field shielding. C is for electrostatic conductive. D is for electrostatic dissipative. ESD Garments are also manufactured with the ESD Protective Symbol because they contain conductive threading to shield charges. The black threading you see is carbon-based and is how electricity travels through the garment. While cotton and polyester are typically used to the carbon threading ensures that static on our skin and torso cannot leap through the jacket onto electronics we are near. If you see the yellow tag on a smock or lab coat, this is a quick way to distinguish whether it is for static control or not. Next post: How Do ESD Smocks Work?